One thing that did not sell us on this house was the stairs. We bought the house despite the stairs. The stairs are U-G-L-Y! Hubsbeast insists that they're "not that bad"...but he's a man. They are that bad. Yes. They are THAT bad! I don't know what the previous owners were thinking- but it wasn't anything good. This is proof of how wrong DIY can go. Lino with carpet? Seriously?! Whomever thought that was the solution should be shot. So ever since we bought the house I've been formulating a plan. This plan as been slow to develop and even slower to be realized. It's required lots of research on my part- but today I was finally ready to act. I've gotten lots of quotes for solutions to these stairs. At first I thought we'd use the boxes of extra laminate that the previous homeowners left us to do the stairs if we had enough. We DO have enough- we just don't have the funds to get it installed (150$ per tread! And we'd have to buy nosings too. With 13 treads, it's not happening.) 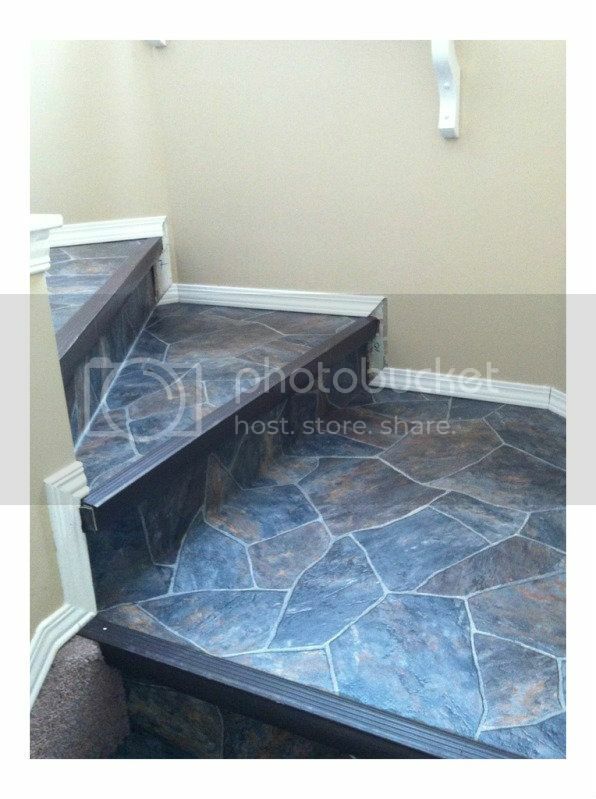 The next option I looked at was just re-carpeting them...but we have laminate hardwood that looks really nice on the main floor and the upper floor, and it seemed to me that it'd look really weird to have carpeted stairs when neither of the floors the stairs connect to are carpeted. 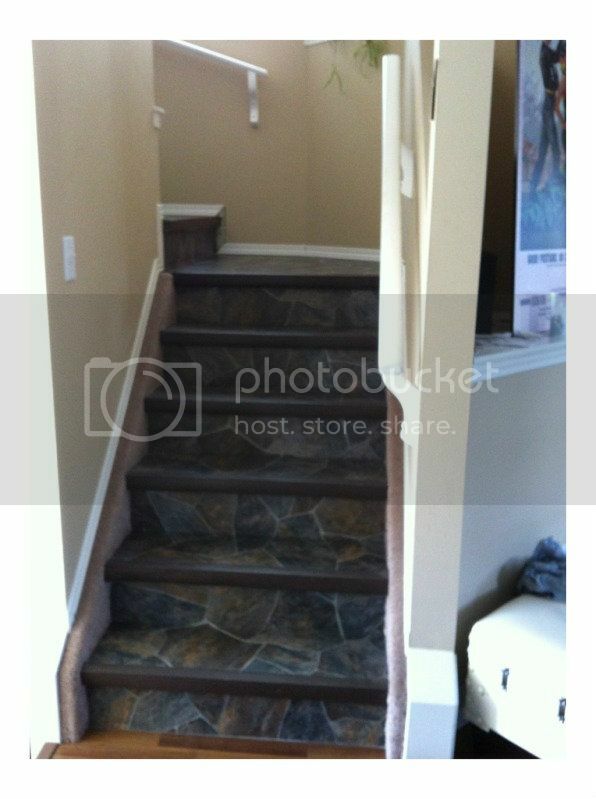 I looked at having solid wood false treads made to cover the stairs, but that odd shaped landing and really wide winding treads in Exhibit B drove the price insanely high- I don't have the budget for custom. Being an avid Pinner, I've obviously seen the pins for "paper bag flooring". I've fallen in love. I love the look- to me it looks kind of like cork flooring. I love that I can stain it go with the laminate hardwood on the main floor. I love that it's cheap. I love that it's easy to do a custom instal. I love pretty much everything about it. 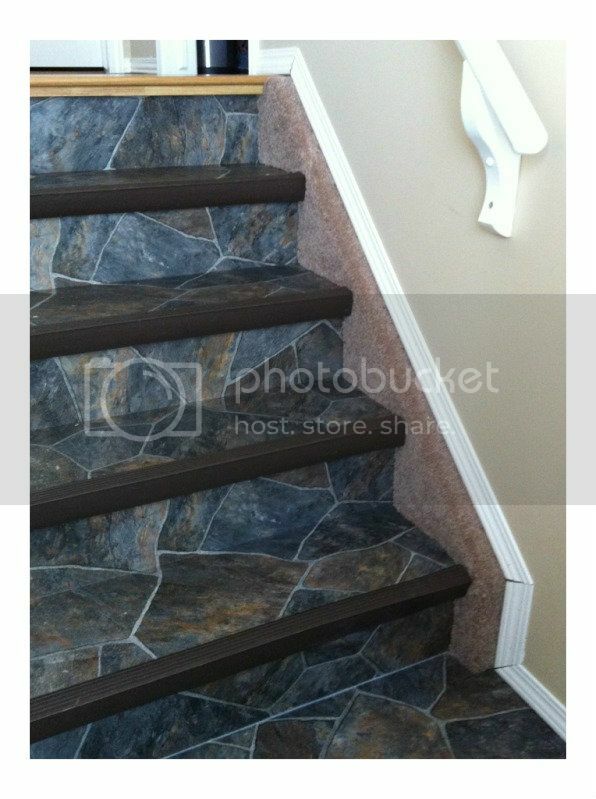 Then I hit a snag: every instal I'd seen done on stairs was done using stairs that had a rounded bullnose. Under all that lino, the bullnose on our stairs is square. And I really didn't want to have to learn to use a router to try and round off the bullnoses. That seemed like it was doomed to failure. I shelved my dream of pretty, inexpensively finished stairs- and went back to trying to accept that carpet was the only way. Then I saw this post on Joyfolie. She did it on stairs with a square nosing!! And it doesn't look horrible!! 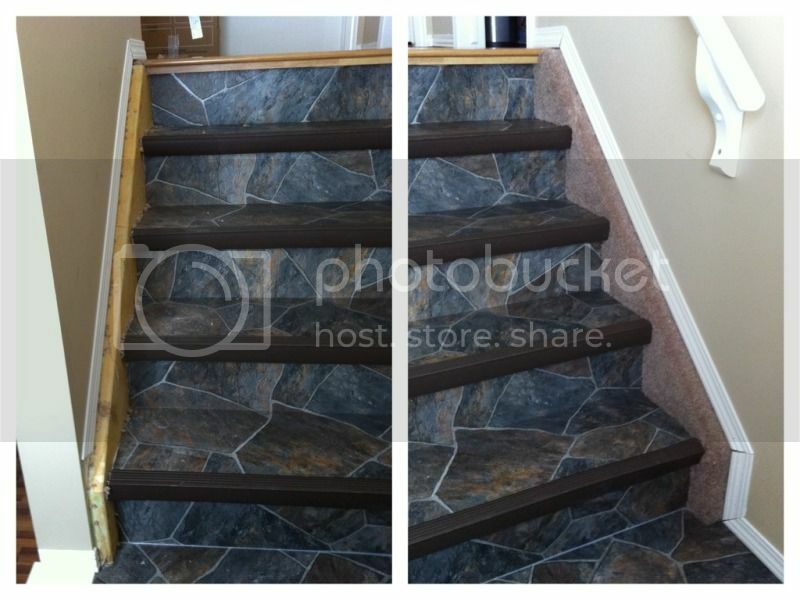 It filled me with hope and renewed determination: I'm going to paper mache my stairs!! Today I took the first tiny little step towards finally biting the bullet and doing it: ripping up the carpet on the stringers. 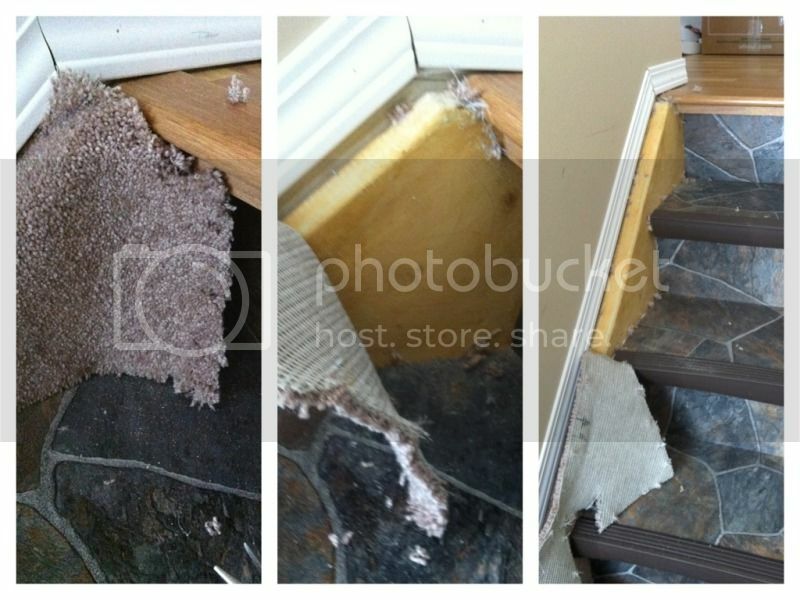 I have to say, I'm not sure why the previous owners didn't rip the carpet all the way off in the first place. It took me less than half an hour to rip it all off, and pull out the majority of the staples. The few that were left I had to get Hubsbeast to do- I just wasn't strong enough. But it took no time at all! I'd ripped it all off and was working at the remaining staples when my cousin called and asked me to take him to Ikea (he just moved to town from across the country) and I swept the dust and staples I had gotten out and was out the door- NO TIME! And even though I only got one done today- it already looks so much better!! So much better- right?! Just imagine that board painted, and the crap window trim the tried to pull off as a base board gone. So. Much. Better! So tomorrow before I go to work I'll probably do the other side of the upper set, and if I have time the lower set too. If not I'll do it when I get home from work. Once all the carpet is off and the staples out (yipee!) then I'll start on tearing off the lino. The nosings are all pretty much falling off as it is- most of them are just sitting there not being held on by anything. And I'm fairly certain that the lino is only glued around the edges. At least I'm hoping and praying it is. Then there's the dilema of how to trim the landing and the winding stairs. I don't know how to do it properly, but I do know what they did is WRONG. Luckily that's finishing work- and hopefully my DIY superstar mother will be here by then to help me figure it out. Let the redo of the Super Ugly Stairs (SUS) begin! !